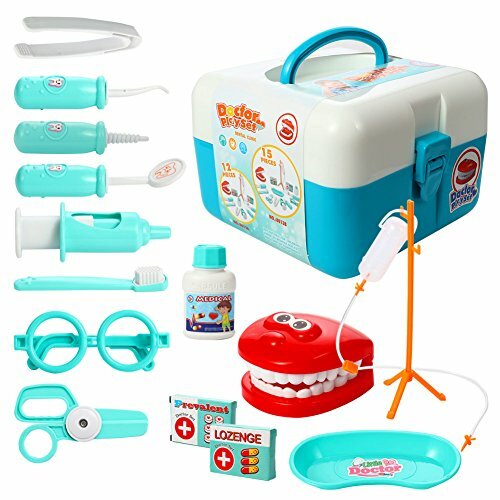 This doctor kit for kids comes with 15 fun, colorful pieces— Eyeglasses, Tweezer, Syringe, Scissors, Oral Mirror, 2 * Pill Bottles, Toothbrush, Denture, Pill case, tray, Transfusion and stand, Teeth hook, Screw filler. Plus, it includes a convenient, free carrying case. Thick durable plastic and a strong design ensure this doctors kit will last your kids for years. If your child gets nervous about doctor visits or checkups, this pretend doctor play set will normalize these experiences to ease any fears your child has. 15 TOOLS TO PLAY DOCTOR: This pretend-n-play medical set offers a variety of super durable doctor's tools including the following: Eyeglasses, Tweezer, Syringe, Scissors, Oral Mirror, 2 * Pill Bottles, Capsule case, Toothbrush, Denture, Tray,Transfusion stand, Transfusion, Teeth hook, Screw filler. WIDE APPLICATIONS: Super value toy pack for doctor dress up set. Perfect for party, pretend play, role play, school classroom, holiday toy gifts, Christmas gifts and more!!! Create hours of fun playtime. SAFE AND HIGH QUALITY: This toy set is made of environmental and kid safe plastic, never need to worry about the safety of your boys and girls. Best gift for kid above 3 years old. ROLE PLAY AND LEARN: Learn practical life skills, explore empathy and care for others by this doctor play set, bring your children a new experience of being nurse & doctor. CARRYING CASE INCLUDED: We've got you covered with easy storage! The sturdy, spacious carrying case fits all doctor kit toys comfortably. Snap-lock latches keep the case securely closed, and are easy for children to handle. If you have any questions about this product by ETbotu, contact us by completing and submitting the form below. If you are looking for a specif part number, please include it with your message.